When the temperatures dip to fifteen degrees or less, I do not go outside. (Which is why you haven’t seen many outfit pictures lately.) Since I was going to be home for a few days, I made a big pot of bean and vegetable soup. First prepare the beans. Place contents of soup mix/beans in large bowl, cover with plenty of water and soak overnight. Save the seasoning packet to add to the rice. In the morning, drain the beans, place into 4-quart pot with plenty of fresh water. Bring to a boil, then turn down heat to low, cover, and simmer 1½ hours. Next, make the rice. Add broth to a 6 or 8-quart soup pot. Add the rice and the seasoning packet and bring to boil. Turn heat down, cover, and simmer for 30 minutes. Drain the water from the beans and add them to the soup pot with broth and rice. Add carrots, onion, celery, green and red pepper, and garlic. Cover and simmer 30 minutes. Add a bag of frozen vegetables, canned tomatoes, lemon juice, pepper and salt to taste, and oregano. Simmer for another hour with the lid tilted. I kept an eye on the pot and stirred the soup occasionally. I also added a bit more vegetable stock as needed because I didn’t want the soup to be too thick. I have real difficulty following a recipe exactly. To cut sodium, omit salt, prepare with no salt added canned diced tomatoes or diced fresh tomatoes. 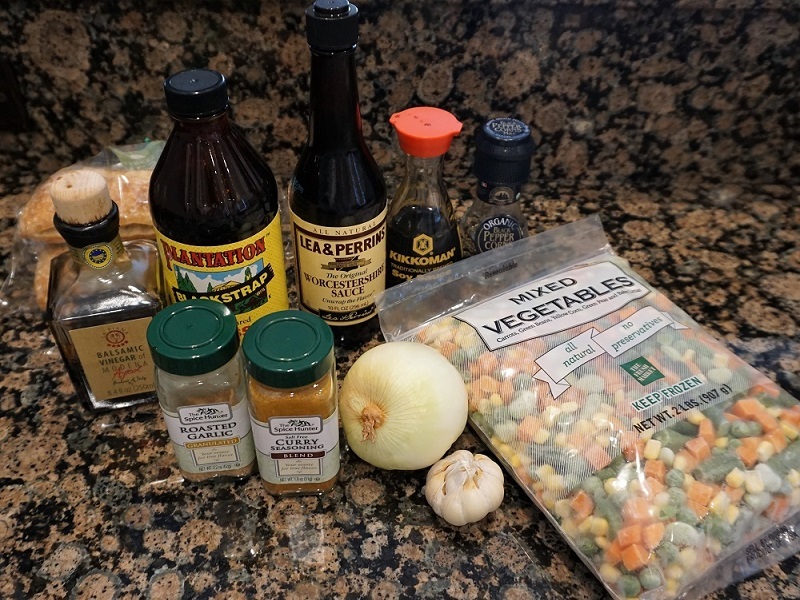 If you find that the soup still needs a flavor boost you could add soy sauce, curry powder, cumin, roasted garlic powder, worcestershire sauce, blackstrap molasses and or aged balsamic vinegar when the cooking time is finished. 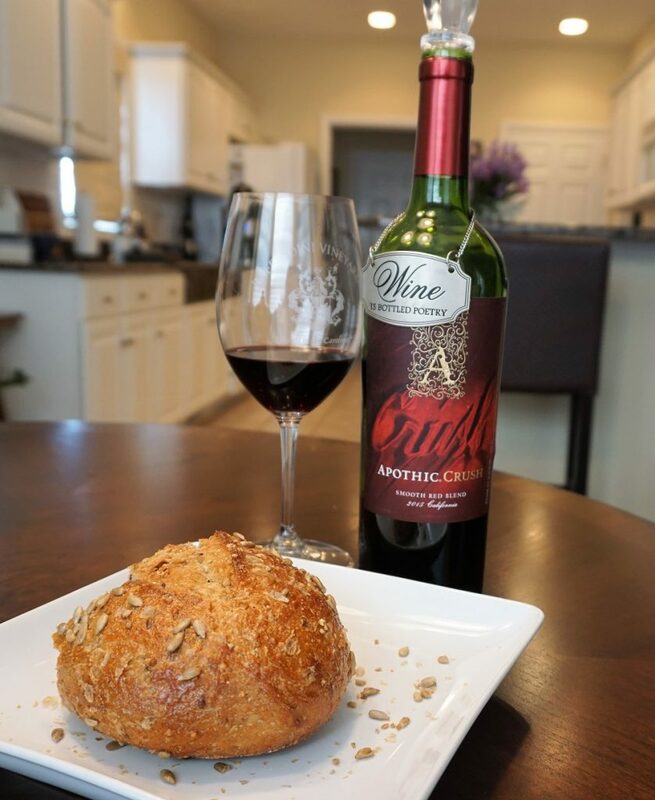 When Mr. Mickey came over bearing flowers and a bottle of wine, I served the soup with a glass of wine and a hearty bread. There was plenty of soup to share with him and for me to enjoy for lunches later. That sounds delicious and I look forward to trying it! Thanks! Soup looks good! I’ll have to try it! Also you have a good man! Your comment about having difficulty following a recipe exactly is quite endearing! Vegetable soup is one of my favorites. Thanks for sharing your recipe! I too make bean and vegetable soup, not with any recipe but using whatever ingredients and seasonings are available and appeal to me at the moment. Such a soup is infinitely flexible — not to mention nourishing. Cheers to Mr. Mickey with his flowers, wine, and steadfastness! I do my best work when I am winging it. Thank you! Can’t think of a better way to spend a day than to stay in with your best friend and partner with some great sustenance. We baked bread on Saturday and it was our lunch. Have a great week. Its freezing here as well and made a big pot of soup yesterday. What a sweet guy that Mr. Mickey! Lovely flowers always good for the soul at this time of year. Looks delicious and the flowers are gorgeous! I made a huge pot of lentil-veggie-spinach-bean soup and we are all still enjoying here. I also have trouble strictly following a recipe- I think because my mom didn’t and I loved her cooking with always a slight flavor variation! 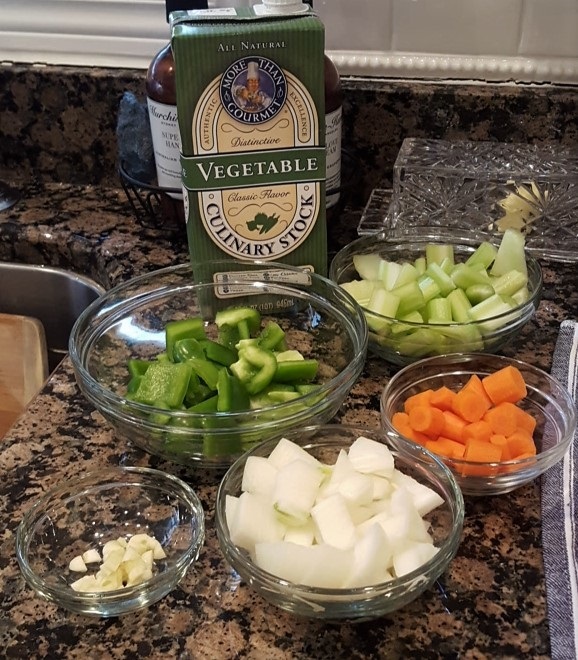 A big pot of vegetable soup is my go-to solution for shedding those extra holiday pounds….works every time. Low-cal and satisfying! Soup looks good and sounds good. 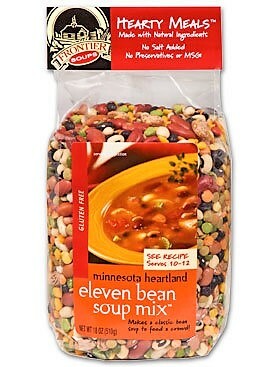 I am from MN and did not know about this bean product. Thanks for sharing. Thanks for the recipe – I look forward to trying it. I had the same Baltic Brown counters until last year when I had to replace them. I miss my darker kitchen in a way. Stay warm. Wonderful recipe as we all try to stay warm. The soup recipe looks wonderful! 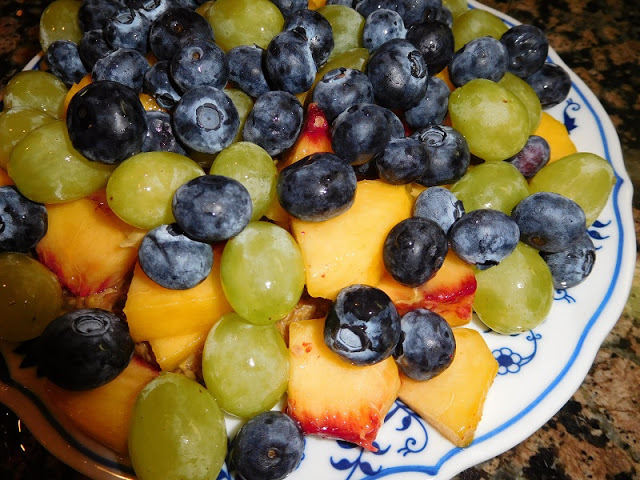 I’m trying to “dip my toes” into the world of clean food ingredients and organic foods. I’m wondering where you get your ingredients, particularly the beans, frozen veggies and vegetable broth. Do you buy them at a regular grocery store, or a specialty food store? I buy many of the organic items from Earth Fare. I always ask my local grocery to carry more organic items. You can find organic items on many websites such as https://www.bobsredmill.com and sunorganicfarm.com or https://nuts.com. Cheers! – nothing like soup on a cold winter’s day (especially with the addition of wine, flowers, and a handsome gentleman). Is the lemon juice for flavor variation? Never used it in veggie soup before. Recipe is going in my “to cook” file. I often add fresh lemon to vegetables because it gives such a burst of freshness. We all must be looking for something warm and satisfying these cold days. Vegetable soup definitely does that! I just made a big pot yesterday and it was similar to yours, but no rice. I don’t eat rice. Have a splendid day enjoying your beautiful flowers, lucky gal! Love Apothic Wine a nice substitute for Prisoner Wine. add more healthy items to my diet, like beans. You can check their website. They have a store locator here. Soup! Soup! Soup! Love it on these cold wintry days and so nourishing! 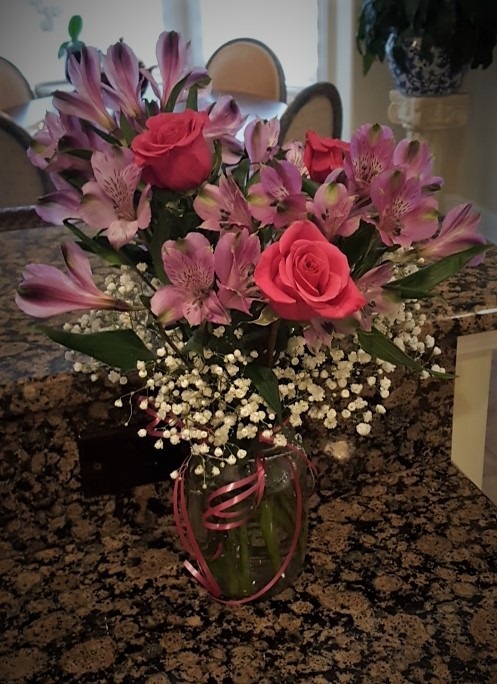 And the flowers….what a special guy!!! Better keep him for sure! Good for you to make positive use of your housebound time! 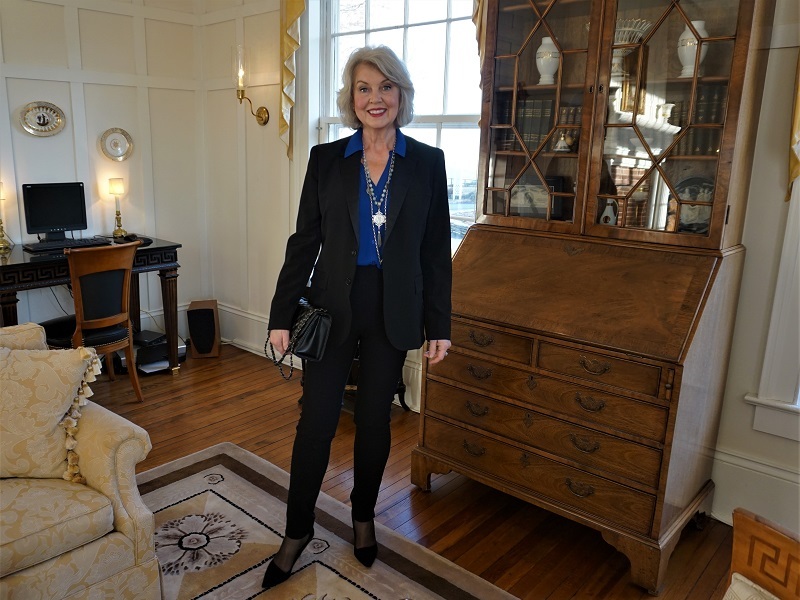 Susan, you are so kind to share your ideas and experiences with us. Thank you! Sounds yummy. I am not a fan of bean soup but my husband will thank you for this.We are liv8ng in England for a couple of years. They puree’ most of their soups. When you order abowl of vegetable soup you won’t “see” the “veg” as they call it. I am making leek and potato soup today. I loved the look of the bread. Soup and bread my favourite winter lunch. Cheers! My kind of wine!!!! Love Apothic! Thanks for the recipe, Susan!!! Aren’t those home-cooked meals, shared in your cozy home with your love (especially one who brings beautiful flowers and a bottle of wine), some of the most wonderful? Indeed! Love to you both. I will try this recipe. Thanks for sharing! By the way, I LOVE the wine hang tag! Do you mind if I ask where you bought it? We bought that a few years ago at the gift shop at Shelton Vineyards in Dobson, North Carolina. What lovely flowers and wine for a hearty bowl of soup! You two are fun to follow your escapades. I am going to try this – looks delish! We took a cooking lesson on a trip to Italy one time and the chef told us to hold off adding vinegar until you’re ready to serve the dish. It’s flavor is best if it hasn’t been heated. I so appreciate your information on health and healthy recipes. I now add teff to my porridge and was glad to learn about it. Someone recently told me about moringa tree tea and powder so I started looking into that. I wondered if you have heard about this and learned anything about it? Thank you.